My two-day stopover in New York and New Jersey was too short, but very sweet. Arriving in JFK airport late Friday night, I followed my cousin's son Jason's directions and arrived easily at their new apartment in Long Island City, Queens. When Andre and I visited them during our honeymoon in August 2008, Jason and his wife Jessica were living in a smaller building across the street, and their 10-month-old son Marcelo wasn't even conceived yet. He is such a cutie and looks just like a Latino Jason. I'm also impressed with their parenting style because they're raising him just like I raised Maya: bilingually, taking him everywhere with them, feeding him a wide variety of healthy foods, giving him lots of freedom to explore, but explaining to him what's not okay to do. I'm jealous that he sleeps through the night. The next day the four of us went to the rooftop of their building and enjoyed the postcard-perfect view of Manhattan and Queens. The owner of the building fixed up the rooftop, with bamboo fencing and lots of potted plants. Jessica hosted Jason's birthday party on the roof this year. In the early afternoon I took the subway and train out to Plainsfield, NJ to visit our friends Hubert, his son Kenyon, and his Dominican wife Antonia. Maya and I met Antonia and her friend Nena in Santo Domingo in August 2006, on the same trip we met Andre. We invited the two policewomen to accompany us to a time share in Cabarete. There we met Hubert who fell in love with Antonia at first sight. Since he didn't speak much Spanish and she didn't know English yet, I acted as translator to get them together. Antonia's been in the US for over a year now. While Antonia was at work, Hubert dropped Kenyon at a friend's house while we visited with Andre's half-sister in Irvington, NJ. We've spoken by phone many times, but this is the first time in person. I'm sorry Andre wasn't with me, but he's working and couldn't get the time off, even if we had the money for both of us to travel. Carline is so beautiful and friendly. I can't wait for her and Andre to meet. 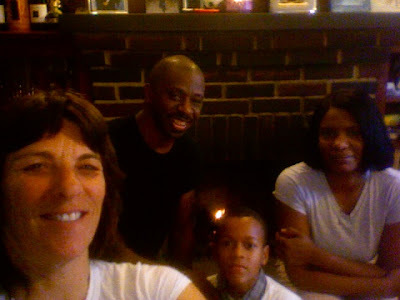 On Sunday I traveled out to Brooklyn to visit Andre's Aunt Rosette, his cousin Louloun, and her daughter Yasmene. Andre and I met them together on our honeymoon and we've been close ever since. Louloun and Yasmene nearly came to Santa Cruz last year, but couldn't get the discounted flights they'd hoped for. And after the earthquake, Louloun was planning to meet up with us in Haiti, but the all-black medical team that she'd signed up with had financial problems and the mission fell apart at the last minute. Rosette wants to come visit us in California, but she's afraid of flying, so she says she'll come by train even though it takes three days each direction. The last time Rosette was on a plane was in 1996 to attend Andre's father's funeral in Haiti...twelve years before Andre even learned his father's name. Rosette got up at 6:00 a.m. on Sunday to start preparing an incredible Haitian feast of shrimp and chicken stew, polenta, pureed black beans, and yellow yams. I took four helpings and she still complained that I didn't eat enough. Another special treat was meeting Rosette's brother Osner, age 75, the eldest of Andre's father's siblings. Together we called Carline and Andre so they could talk to Osner during our visit. He's in really good shape for his age. Last night I took a red eye from JFK to London. I slept maybe a couple of hours. After a few hour layover I took a quick flight to Hamburg. My friend Petra was there waiting for me at the airport. It's weird not to have a cell phone. Making arrangements with friends is much more complicated like this. After a nice German dinner of dumplings and meat, Petra and her husband Bernhard helped me make train reservations for tomorrow, so my friend Tanja can pick me up and we can drive together to the village of Stemshorn where I lived in the summer of 1974.